Við kynnum áfram nokkur íslensku verkanna á sýningunni hem : HJEM : koti : heim : heima : angerlarsimaffik í Silkeborg Bad. Fleiri færslur bætast við á næstu vikum. Lesið líka fyrri kynningar:  Zoo og  Babel. In the weeks to come we will introduce some of the works by the Icelandic artist in the exhibition hem : HJEM : koti : heim : heima : angerlarsimaffik in Silkeborg Bad. This is the third post. Read also:  Zoo and  Babel. stærð: 32 x 23 x 38 cm. size: 32 x 23 x 38 cm. Ingiríður vinnur við myndlist, bókverk og textílhönnun. Hún stundaði nám við Myndlista- og handíðaskóla Íslands. Hún hefur tekið þátt í fjölda samsýninga á Íslandi og í Svíþjóð, Finnlandi, Danmörku, Belgíu og Bandaríkjunum. Hún býr í Hafnarfirði. 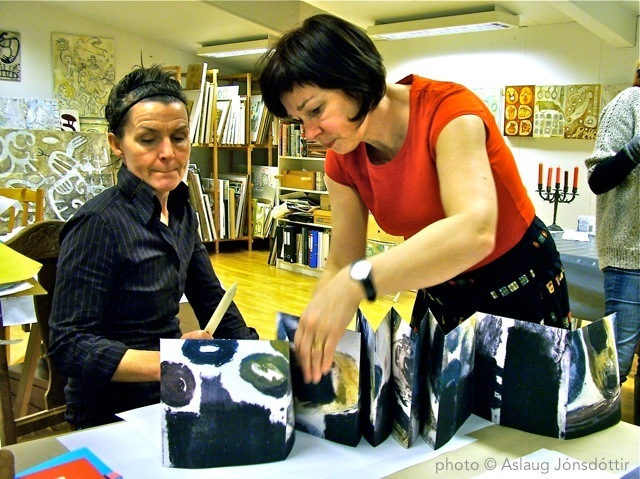 Ingiríður works on her art, artist books and textile design in her studio in Garðabær. She studied at The Icelandic College of Arts and Crafts. She has participated in numerous group exhibitions in Iceland and Sweden, Finland, Denmark, Belgium and the USA. She lives in Hafnarfjörður. Þessa dagana kynnum við nokkur íslensku verkanna á sýningunni hem : HJEM : koti : heim : heima : angerlarsimaffik í Silkeborg Bad. Fleiri færslur bætast við á næstu vikum. Lesið líka:  Zoo. In the weeks to come we will introduce some of the works by the Icelandic artist in the exhibition hem : HJEM : koti : heim : heima : angerlarsimaffik in Silkeborg Bad. This is the second post. Read also:  Zoo. stærð: 43 x 36 x 36 cm. Allir jarðarbúar töluðu sömu tungu og notuðu sömu orð. Svo bar við er þeir fluttust að austan að þeir fundu lágsléttu í Sínearlandi og settust þar að. Þá sögðu þeir hver við annan: „Komum nú og búum til tígulsteina og brennum þá í eldi.“ Þeir notuðu tígulsteina í stað grjóts og bik í stað steinlíms. Og þeir sögðu: „Komum nú, byggjum okkur borg og turn sem nái til himins. Þar með verðum við frægir en tvístrumst ekki um alla jörðina.“ Þá steig Drottinn niður til þess að sjá borgina og turninn sem mennirnir höfðu byggt. Og Drottinn sagði: „Nú eru þeir ein þjóð og tala sömu tungu. Þetta er aðeins upphaf þess sem þeir munu taka sér fyrir hendur. Hér eftir mun ekkert verða þeim um megn sem þeir ætla sér. Stígum nú niður og ruglum tungumál þeirra svo að enginn skilji annars mál.“ Og Drottinn tvístraði þeim þaðan um alla jörðina og þeir hættu við að byggja borgina. Af þeim sökum heitir hún Babel að þar ruglaði Drottinn tungumál allrar jarðarinnar og þaðan tvístraði hann þeim um alla jörðina. – – – Fyrsta Mósebók 11. 1-9.
size: 43 x 36 x 36 cm. Now the whole earth had one language and the same words. And as they migrated from the east, they came upon a plain in the land of Shinar and settled there. And they said to one another, “Come, let us make bricks, and burn them thoroughly.” And they had brick for stone, and bitumen for mortar. Then they said, “Come, let us build ourselves a city, and a tower with its top in the heavens, and let us make a name for ourselves; otherwise we shall be scattered abroad upon the face of the whole earth.” The Lord came down to see the city and the tower, which mortals had built. And the Lordsaid, “Look, they are one people, and they have all one language; and this is only the beginning of what they will do; nothing that they propose to do will now be impossible for them. Come, let us go down, and confuse their language there, so that they will not understand one another’s speech.” So the Lord scattered them abroad from there over the face of all the earth, and they left off building the city. Therefore it was called Babel, because there the Lord confused the language of all the earth; and from there the Lord scattered them abroad over the face of all the earth. – – – Genesis 11. 1-9. Áslaug er rithöfundur, teiknari og grafískur hönnuður. Hún stundaði nám Myndlistaskóla Íslands og Skolen for Brugskunst, nytjalistaháskólanum í Kaupmannahöfn. Hún hefur enn fremur tekið þátt í námskeiðum í Bandaríkjunum, Svíþjóð og á Íslandi. Hún býr í Reykjavík og er starfandi barnabókahöfundur og bókverkakona. Áslaug is a writer, illustrator and graphic designer. She studied art at The Icelandic College of Arts and Crafts and at Denmark’s School of Design, Copenhagen, Denmark. She has attended art courses in USA, Japan and Iceland. 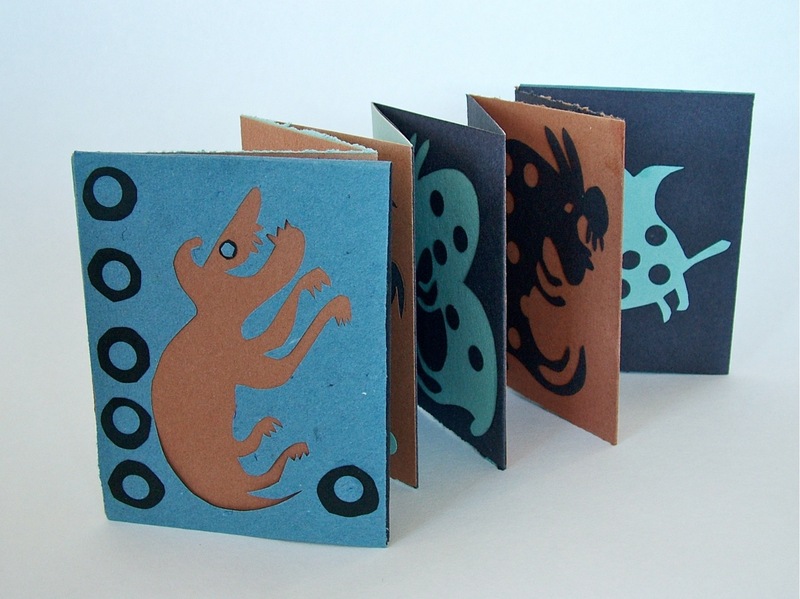 She lives in Reykjavík and is an active childrens’s books writer and book artist. ARKIRNAR fjórar sem mættu á námskeið hjá origami-listamönnunum Dave og Assia Brill í Menningarmiðstöðinni Gerðubergi um síðustu helgi verða nú að játa á sig æði mörg brot. Námskeiðið var tveggja daga öflugt grunnnámskeið þar sem nemendur sátu einbeittir frá morgni til kvölds við að brjóta pappírinn rétt og rækilega. Kennararnir voru engir aukvisar í faginu: þau hjónin hafa stundað origami listina í árafjöld, með ótal sýningar og viðurkenningar að baki. Í Gerðubergi stendur yfir stórgóð sýning á verkum þeirra og einnig nokkurra félaga í Origami Ísland. Sýningin stendur til 24. mars. The four of us ARKIR who were lucky enough to take part in a two-days intensive Origami course at Gerðuberg Culture Center last weekend had a great time folding paper and learning to understand the art of origami. Teachers Dave and Assia Brill were admirably patient and thorough in their instructions as they lectured us in basic origami folding. 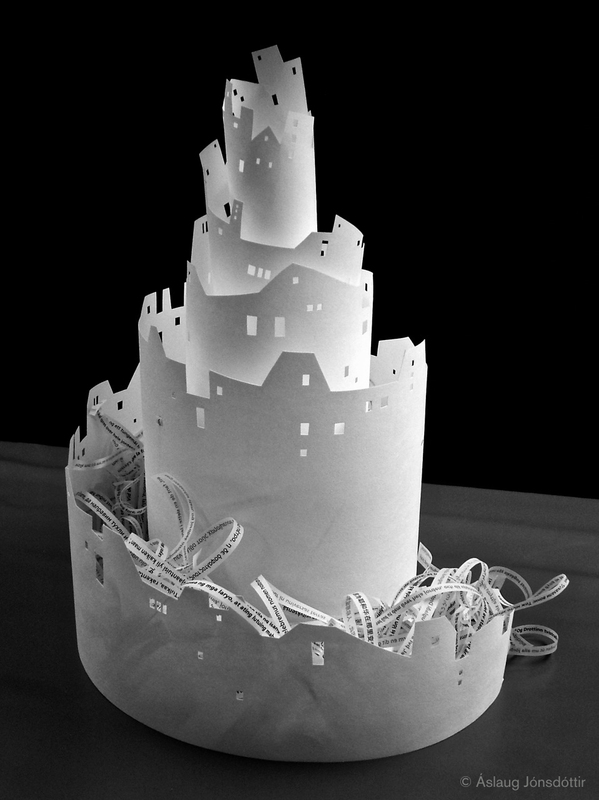 An ongoing exhibition at Gerðuberg gives a view on their art: beautiful and clever designs and amazing sculptures. 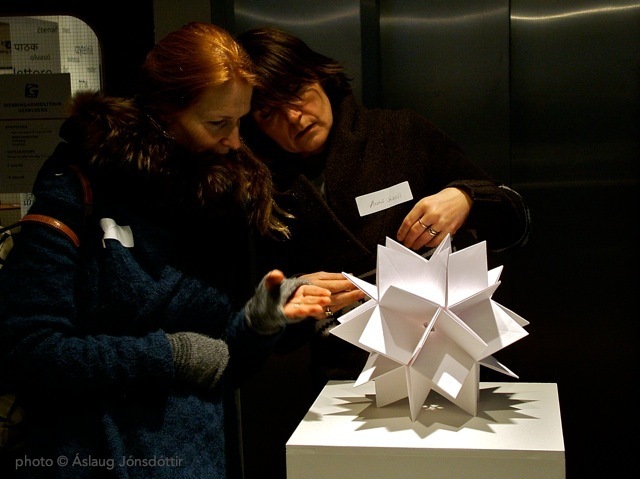 Go see their art and also origami by members of Origami Iceland at Gerðuberg Culture Center! Exhibition’s last date: March 24. Um sýninguna í Gerðubergi / More information on the exhibition at Gerðuberg‘s website. Heimasíða: Dave and Assia Brill – homepage. Mbl-Sjónvarp: Heimsklassa origami í Gerðubergi / Morgunblaðið Newspaper video from the exhibition, stating: “World-class origami in Gerðuberg”. Undraforlagið Crymogea, sem svo gjarna gefur út firnavandaðar, hnausþykkar og fagrar myndabækur, stendur fyrir listabókamarkaði dagana 1., 2. og 3. febrúar 2013 frá kl 11-17. Þetta er í annað sinn sem Crymogea stendur fyrir markaði af þessu tagi. Listafínar bækur eftir bókverkafólk úr ýmsum greinum sjónlista verða á boðstólum í húsakynnum Crymogeu að Barónstíg 27, ofan við Laugaveg. Ekki missa af besta bókamarkaði ársins! Crymogea, publisher of rare and beautiful books, holds a market of art books next weekend from Friday to Sunday, February 1. 2. and 3. from 11 am to 5 pm. 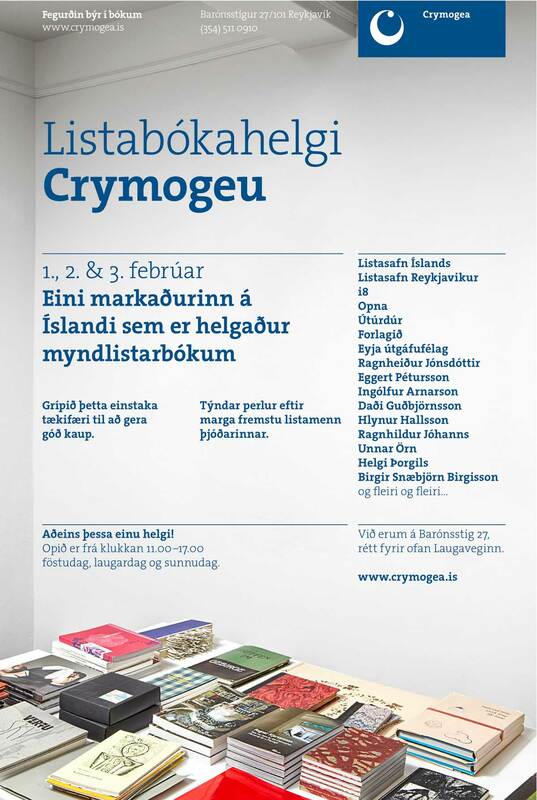 Art books and artist’s books, all sorts of awesome books by various visual artists will be sold at Crymogea’s market, at Barónstígur 27, just by Laugavegur. Don’t miss Reykjavik’s best book market! ARKIRNAR hittast nær vikulega um þessar mundir. Það þykir ekki verra að byrja fundi með málsverði enda ekki vanþörf á þegar halda þarf dampi á köldum vetrarkvöldum. Í þetta sinn var það austurlensk lambakjötssúpa og nýbakað brauð. Að því loknu var hægt að hefjast handa enda mörg verk í smíðum og heilabrotin í það minnsta jafn flókin og bókabrotin. ARKIR are at it! We try to get together every week now, keeping spirit high in preparations for the exhibition HOME. Starting every meeting with a solid meal – like tonight’s fresh-baked bread and spicy soup of lamb meat and vegetables – helps everybody going on a cold winter evening. Inga Örk með langa örk – roll of printed art by Anna soon to be folded to a book. Ísland ögrum skorið – af Ingu. Recycled book – artwork by Inga. Næstu helgi verður mikið um dýrðir fyrir unnendur pappírs- og bókverka. 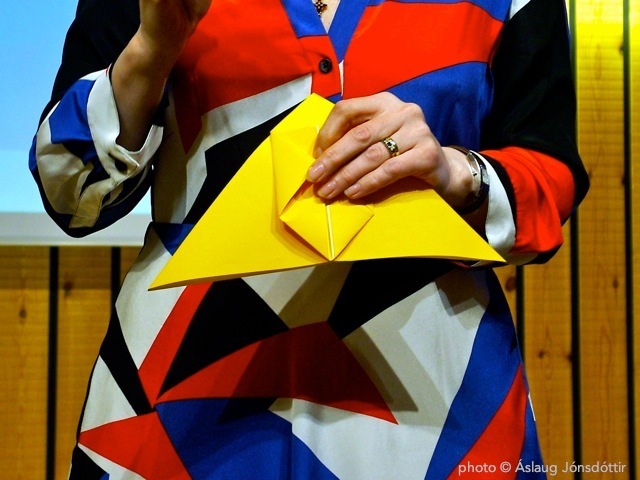 Námskeið og sýningar tengd bókverkum og origami verða haldin bæði í Breiðholtinu og Garðabænum. Origami – Brot í brot. Sýning og námskeið í Menningarmiðstöðinni Gerðubergi. Föstudag og laugardag 26. – 27. janúar leiðbeina þau síðan á origami-námskeiði fyrir hönnuði, lista- og handverksfólk. ARKIR munu fjölmenna á námskeiðið og vonandi má fregna af því síðar. Sjá nánar á heimasíðu Gerðubergs – Menningarmiðstöðvar. Klippt og skorið. Skapandi bókverk og einfalt bókband í Hönnunarsafni Íslands. Fyrri hluti, fyrirlestur. Klippt og skorið, fyrirlestur um skapandi bókverk og einfalt bókband. Kynntar verða til sögunnar fjölmargar aðferðir við að búa til bókverk, mismunandi bókarbrot og skapandi bókverk hönnuða skoðuð. Síðari hluti, vinnusmiðja. Þátttakendur búa til bókverk og velta fyrir sér með tilraunum breytilegu formi bókarinnar og möguleikum hennar. Á staðnum verða gamlar bækur sem þátttakendur geta notað sem efnivið í tilraunirnar. Sjá nánar á heimasíðu Hönnunarsafns Íslands. Workshops, lectures, courses and exhibitions! 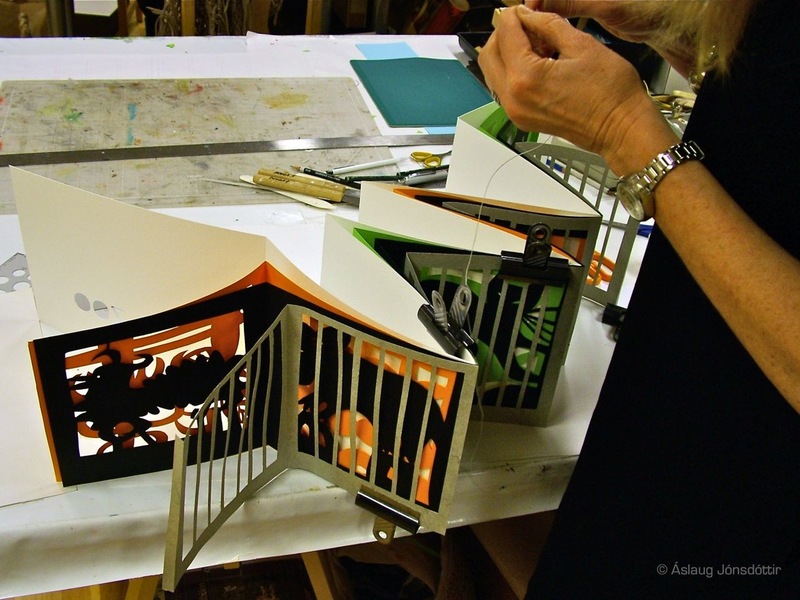 We are looking forward to next weekends events: workshops, courses and exhibitions of book art and origami! 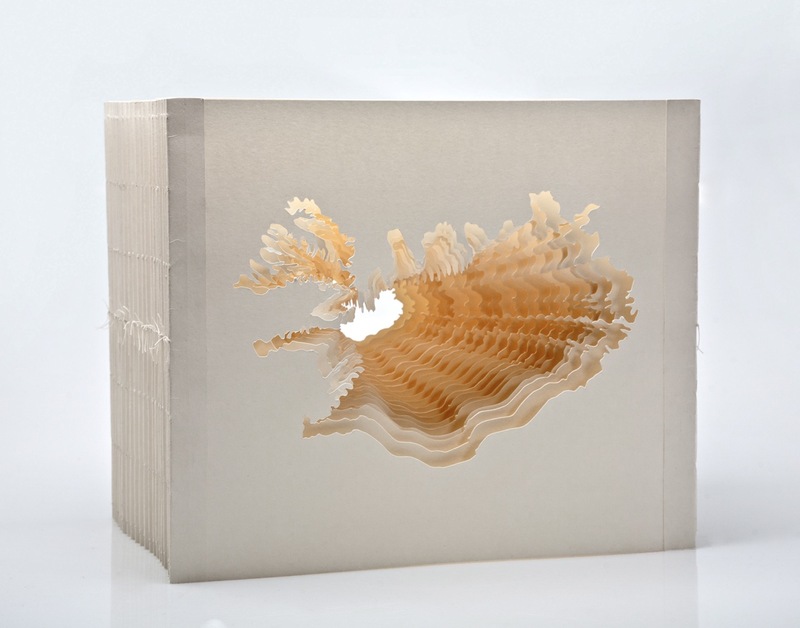 What a treat for paper and book art lovers! 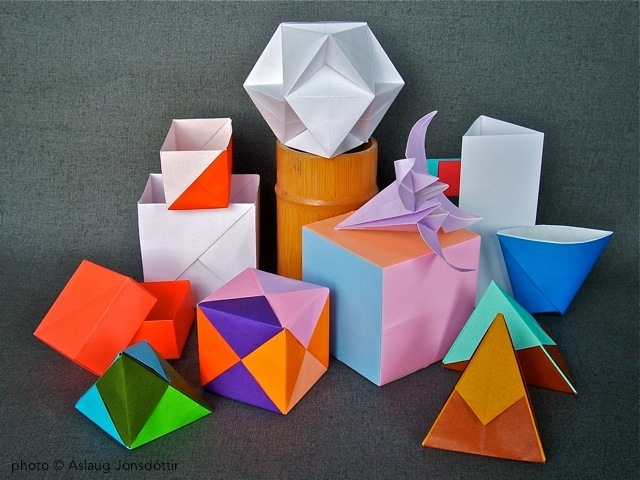 In Gerðuberg Art Center origami-artists Dave and Assia Brill show their work in an exhibition which opens Thursday January 24. And on Friday and Saturday 25.-26. of January they teach in a course for designers, artists and craftsmen. 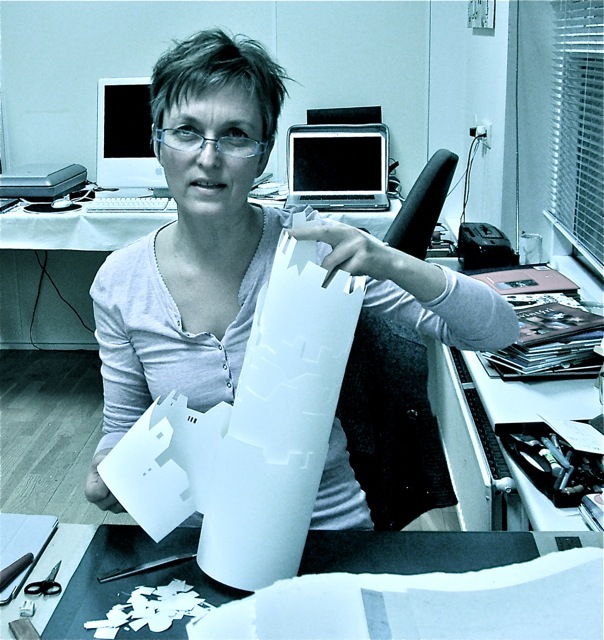 In Museum of Design and Applied Art in Garðabær, Sigurborg Stefánsdóttir, visual artist and member of ARKIR will be giving lecture and workshop next Friday, January 25, from 9 am to 3 pm. See MUSEUM OF DESIGN AND APPLIED ART. ARKIR undirbúa þátttöku í samsýningu sem opnar í Silkeborg í byrjun apríl. Sýningin: „hem : hjem : koti : heim : heima : angerlarsimaffik“ er kynnt nánar á sameiginlegum vef þátttakenda: CON-TEXT. Það rær hver og slær með sínu lagi og enn eru margir lausir endar og óskrifuð blöð. Allra handa bókverk eru þó að taka á sig mynd. ARKIR are working on books for the Nordic exhibition “HOME” (hem : hjem : koti : heim : heima : angerlarsimaffik) that opens in Denmark in early April for later to travel to the other Nordic countries. There are still many loose ends and uncut sheets, but some interesting works are starting to unfold. 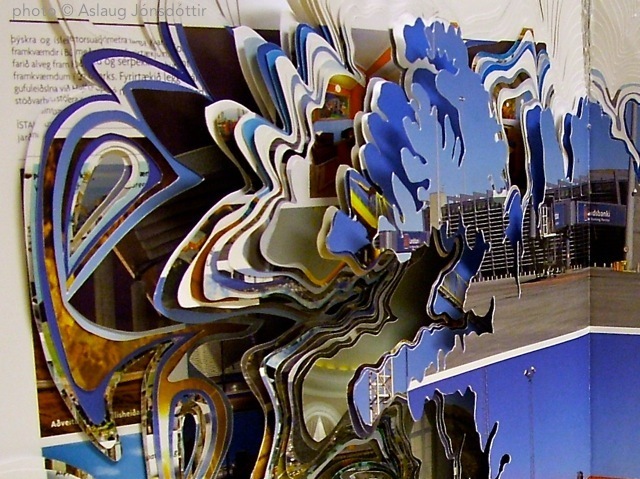 Read more about the exhibition on the blog of CON-TEXT. Click to subscribe! Smelltu hér til að gerast áskrifandi! All material on this site © copyright by Áslaug Jónsdóttir unless otherwise indicated. All Rights Reserved. //// Myndir og texti © Áslaug Jónsdóttir nema annað sé tekið fram.